Description: Chart of Île d'Orléans on the St. Lawrence showing both Quebec and the islands and sandbanks to the East. Coloured. Description: Orleans and environs of Quebec. Coloured. Description: City plan of Quebec published during the French Indian War, just after its capture by General Wolfe. Coloured. Description: Miniature map of Quebec City together with the fortress. Description: Isle D'Orleans and Quebec. Decorative cartouche and original hand colour. Description: Quebec City and environs. Coloured. Description: Striking map of Quebec and its environs with a detailed cross section of St. Laurent river from Montreal to Quebec. Printed colour. 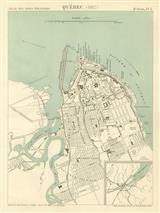 Description: Plan of the city of Quebec with an inset showing the position of the city on the St. Lawrence. Printed colour. Description: Miniature city plan of Quebec. Printed colour. Description: Quebec and its Environs. Original Colour. Description: Quebec. City plan. Original printed colour.